Tahini French toast is a new take on a breakfast classic. Challah bread is dipped in custard and grilled before it is covered in sweet honey, rich tahini, cinnamon and flaked sea salt. We love the combination of sweet and salty and the salt in this recipe tames the bitterness of the tahini while at the same time elevating the sweetness of the honey. Tahini, also known as sesame paste, is available at most grocery stores and relatively easy to find these days. Step 1: In a large shallow bowl, whisk together the almond milk, eggs, and sugar until well combined. Step 2: Dip bread into the custard mixture, allow to soak for 30 seconds on each side. Remove any excess custard mixture and set aside on a cooling rack over a baking sheet. Step 3: Melt 2 tablespoons in a non-stick saute pan over medium low heat. Place 2 slices of bread at a time into the pan and cook until golden brown, approximately 2 to 3 minutes per side. Continue with the remaining slices of bread, adding more butter as necessary. 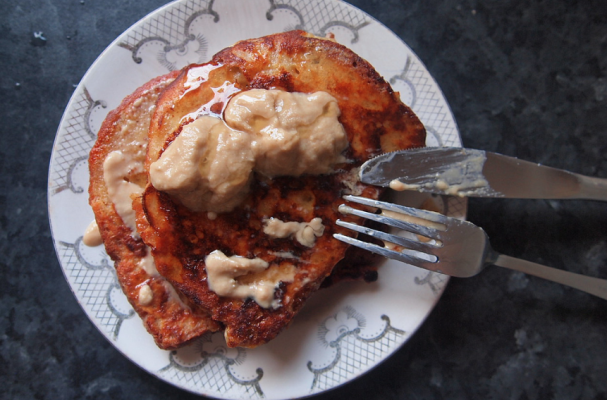 Step 4: Serve the French toast hot drizzled with tahini and honey, flaked seat salt, a dash of ground cinnamon. *Note: If you have fresh bread, you can leave it out overnight or dry out the slices in a low oven until lightly toasted.